Four Josenians bagged awards from the 2018 World Championship of Performing Arts (WCOPA) held at the Long Beach, California last July 6 to July 14. WCOPA is considered the international pseudo-Olympic competition for performing artists. It has a junior and a senior division. Each division has categories for dance, instruments, vocals, modeling, and acting. The event aspires to create professional education and experiences to the delegates. Maxwell Soller(left) and Miguel Luis Ibaseta (right) hold together the plaque they received for winning the senior division for instrumentalists. Out of the 87 Filipino delegates, four were Josenians. They joined and showcased their talents to the world during the said international competition. 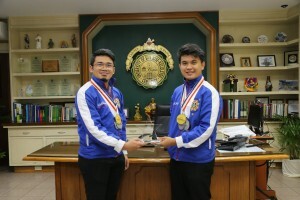 Guitar duo Maxwell Soller and Miguel Luis Ibaseta were hailed as the Senior Grand Champion Instrumentalists of the World. Dubbed as the M Squared, they are the first Cebuanos who won the said WCOPA category for the Philippines. Aside from their plaque, M Squared also received a semi-finalist badge, 2 gold medals, and 5 silver medals for other categories namely Classical, Contemporary, Jazz, Open, and Original Works. Soller is a faculty member of the College of Education while his partner, Ibaseta, is a Grade 12 senior high school student of the University. 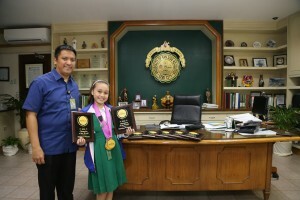 In a junior division, two Josenian gradeschoolers also showed the world their flair. One of them is Klarylle May Dumancas who is currently a Grade 7 student of the Junior High School Department. 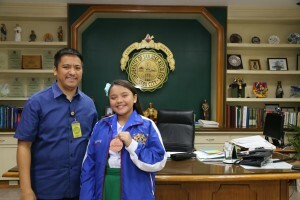 She brought home a bronze medal for her Vocals – Solo in gospel category. She also competed in the other six solo vocals namely Rock, Broadway, Pop, Jazz, Open, and World categories. Meanwhile, Carren Eistrup Frederiksen became a semi-finalist and won 8 gold medals at the junior division for vocals with accompaniment category. She also received a semi-finalist badge and eight Champion of the World Division Winner plaques for the four categories in Vocals – Solo with accompaniment, three categories in Vocals Solo, and the Casual & Formal Wear Category in the Modelling Competition. Team Philippines brought home a total of around 300 medals, plaques, badges, and the only trophy for the grand champion. Cebuano delegates were selected during the WCOPA auditions held at the SM Seaside Cebu City in November last year. One of the judges was Jed Madela, who made a name in the industry after reigning as the WCOPA grand champion in 2005. After the selection, the Cebuano WCOPA delegates have been training with Cebu Music Learning Center to prepare for the international tournament. They also had to prepare their own Visa and other necessary requirements. The four winners had a courtesy call with University President Fr. Cristopher Maspara last Wednesday.